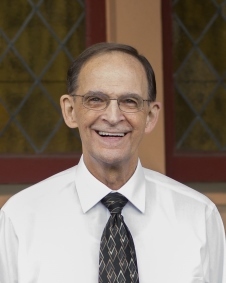 Reverend Jim Anderson passed away Friday, September 28 at the John Muir Medical Center in Concord after a battle with congestive heart failure. Jim was born in Iowa Falls, Iowa on October 28, 1943 to parents Evan and Mildred Anderson, and he and his six siblings grew up on the 600-acre farm his family owned and operated just outside town. setting that would feature prominently in his stories and sermons for the rest of his life. His love extended even more intensely to Bonnie, their three children and their spouses, and their three grandchildren: their daughter Sarah Metz, her husband Noah, and their sons Jeffrey and Joel; their son Joel and his wife Jung Yun; and their son Jeff, his wife Liz (Nou), and their son Parker. Jim was so proud of his family, and nothing on earth gave him more pleasure than spending time with them. He will be missed so much by so many. A memorial service will be held Saturday, October 6 at 11:00 a.m. at First Baptist Church in Martinez, 1802 Alhambra Ave. A reception will follow. A second memorial service will be held in Iowa Falls, Iowa on Friday, October 12 at 11:00 a.m. at the First Baptist Church, 521 Rocksylvania Ave.